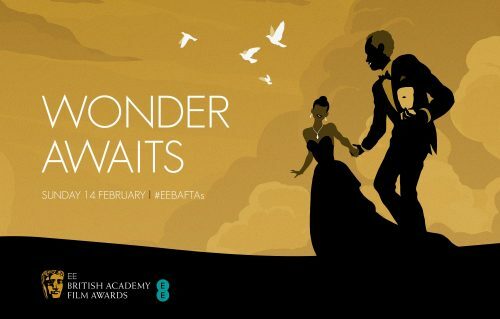 Shortly, BAFTA’s Chair Anne Morrison with Stephen Fry and Gugu Mbatha-Raw will be ammouncing the nominations for the EE British Academy Film Awards in 2016. BAFTA Chief Executive Amanda Berry OBE, Chair of the Film Committee Pippa Harris, and Marc Samuelson Deputy Chair of the Film Committee will also be in attendance. The nominations are being live streamed, see below, to give anyone who wishes to watch can catch the excitement in who will be nominated. After the announcements there will be a live panel discussion between industry critics hosted by Zoe Ball, which film fans can also engage with. Not only that, below is the first poster for the event. The EE British Academy Film Awards will take place on Sunday 14 February 2016 and will be held for the tenth year running at the Royal Opera House, Covent Garden. Sponsored by EE, and hosted by Stephen Fry, the Awards will be broadcast exclusively on BBC One and BBC One HD that evening, preceded by a red carpet show on BBC Three.